Socialism in Medical Care is Here! No Names, Just Numbers! With an ill child in tow, off to the doctor’s office I went today. Since the child had no occasion to have seen a doctor in 5 years, there was no longer a file, hmm? Wonder where they go? Anyway, the child signed in on a clip board and onto a lengthy sticker which was immediately removed and placed on the medical file. 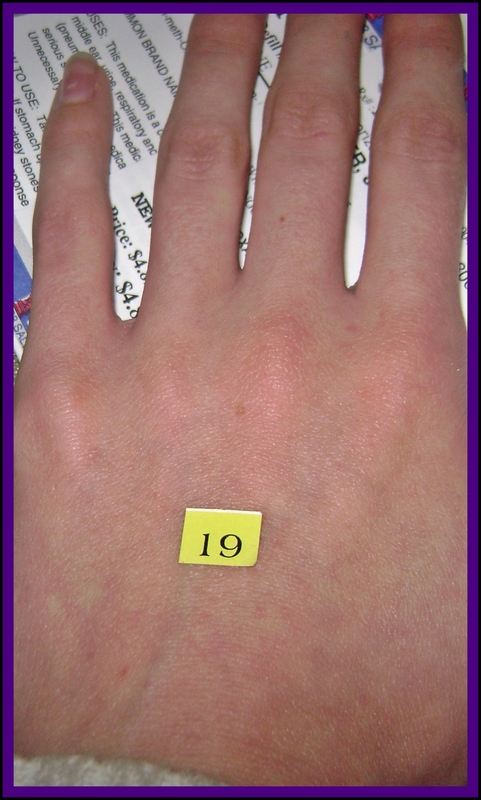 The small number sticker, depicted in the photo below, was adjacent to the long sticker, and said child needed to hold onto it until called. We sat down among the other patients and waited as we always have, when I started hearing numbers called like just at the DMV. I kid you not… at the Doctor’s Office! Also, since I hadn’t been there for myself or any of the other kids for some several months, there was also another noticeable change. It was if a sanitization process had occurred. There were no personal photos of the doctor and family or the fabulous exotic photos that once decorated the facility. It was as if beige, dull, and flat were the selling tool for the new patient waiting experience. I think not! It’s a Socialism Disorder and it’s infiltrating our Beloved United States of America Everywhere! Are “We the People” Trained Sheep? Or are “We the People” the Walking Dead? It’s Health Care Gone Dull! Washington, D.C., July 29, 2010. The Army doctor who is facing a court martial for refusing to obey orders, including a deployment order for his second tour of duty in Afghanistan, has formally requested his Commanding General approve a deposition in Hawaii of the records-keeper of the State Department of Health-and the production of all of their records concerning Barack Obama. The records Lakin seeks have been the subject of intense interest ever since the closing days of the 2008 presidential campaign when a document appeared on the internet purporting to be a certification that Hawaii’s Dept. of Health had records showing he had been born in Honolulu. Since then, Dr. Chiyome Fukino the head of that agency has made public statements on the subject, but has refused all requests for copies of the actual records in the Department’s custody. Recently, a former Hawaii elections clerk has come forward saying that he was told that the Department’s records showed Obama was NOT born in Hawaii. The United States Constitution requires that a person be a “natural born citizen” to be elected to the presidency. If Mr. Obama was not born in Honolulu as he has claimed, then he is unlikely to be a “natural born citizen”. An examination of the records kept by the Hawaii Dept. of Health are an essential first step in ascertaining Mr. Obama’s constitutional eligibility to hold the office to which he was elected in 2008. While no civil litigant has obtained discovery of these records, and all the civil lawsuits seeking those records have been dismissed on procedural grounds, Lakin’s case is different because he is the subject of criminal prosecution, and upon conviction stands in jeopardy of being sentenced to years at hard labor in the penitentiary. Lakin’s civilian attorney has been provided to him by the American Patriot Foundation, a non-profit group incorporated in 2003 to foster appreciation and respect for the U.S. Constitution, which has established a fund for Lakin’s legal defense. Further details are available on the Foundation’s website, http://www.safeguardourconstitution.com. Hold the Congressional Scoundrels Accountable This November! REMEMBER OBAMACARE! Dr. Fred Shessel points out that the politicians that pushed through the recent health care legislation “lied” about its contents and implementation. Just an interesting search on the previously passed Stimulus on StimulusWatch… hmm? This election year’s rally cry: REMEMBER OBAMACARE!